Today, the United Nations Environment Programme (UNEP) published a report that we co-authored on Climate Change and Human Rights, with forewords from UNEP Executive Director Achim Steiner and John Knox, the Independent Expert on Human Rights and Environment. The release of the report coincides with International Human Rights Day as well as a COP21 side event on human rights and climate change, and comes in the middle of ongoing and intense negotiations over the inclusion of human rights language in the climate agreement under discussion in Paris. The report describes the nexus between climate change, environmental degradation, and the impairment of fundamental rights, such as the rights to food, water, housing, and life. It has long been recognized that a clean, healthy and functional environment is integral to the enjoyment of these human rights. And anthropogenic climate change is now the largest and most pervasive threat to the natural environment and human societies. The IPCC’s latest assessment report provides a detailed picture of how the observed and predicted changes in climate will adversely affect ecosystems, natural resources, and the environmental processes that support access to clean water, food, and other basic needs. These impacts, combined with direct harms to people, property, and physical infrastructure, pose a serious threat to the enjoyment and exercise of human rights across the world. This is not merely an abstract, future possibility. Climate change is already affecting temperatures, hydrologic conditions, ecosystem functioning, and agricultural productivity in many regions. Displacement is also an imminent prospect for some communities, such as those situated in the rapidly melting Arctic and low-lying coastal areas. Further complicating the picture, measures undertaken to mitigate greenhouse gas (GHG) emissions and adapt to climate change can themselves adversely affect the enjoyment of human rights. The international community has pledged to allocate or direct $100 billion (US) per year to funding mitigation and adaptation projects in developing nations. It is critical that as the world endeavors to address climate change, it do so with full respect for human rights. 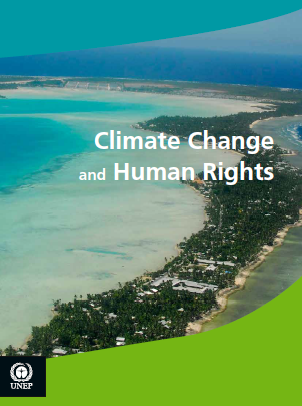 Within this context, the report explains how governments and other actors may address climate change in a manner consistent with their obligations to respect, protect, promote and fulfill human rights. One key goal is to inform the decisions undertaken at COP21 and future international climate negotiations. Another key goal is to inform decisions and actions undertaken by nations, sub-national governments, international organizations and private actors pursuing climate action both within and beyond the context of the UNFCCC in the coming years. Forgive my cynicism (there is so much to be cynical about), add this latest report to the growing pile of NGO reports gathering dust on officials’ shelves. The time for words and awareness raising has long past. Thanks for your thoughts. Did you read the full report? It provides a road map for legal claims in jurisdictions that recognize human rights law. These types of cases have gained some traction over the past year, and we will likely see more of them in the near future. So while there are recommendations for government officials, there is also research that can be used by citizens and organizations to compel government action. Great article! I would have never correlated the link between human rights and climate change!